In the days after 9/11 Americans suffered from a collective post-traumatic stress disorder. Every loud noise, stray backpack, and tense-appearing stranger made us uneasy. Who knew when or how the next threatened strike would hit? Within a month, it seemed that even our most nightmarish fears would be realized. Bacillus anthracis or anthrax, a bacteria occurring naturally in livestock and used in biological warfare, including by the Japanese against the Chinese in World War II, began killing and injuring citizens up and down the East Coast. 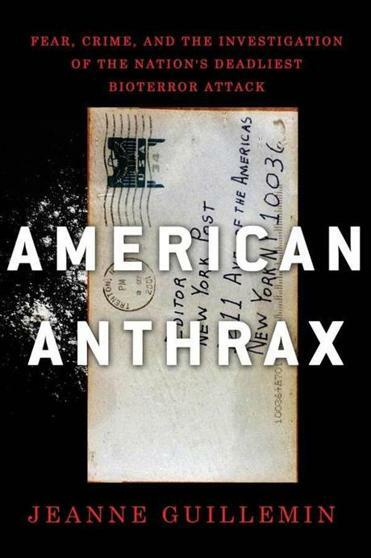 “American Anthrax,’’ whose publication coincides with the 10th anniversary of these terrifying events, is a painstaking chronological account of the anthrax attacks of 2001, and the frantic investigation they prompted. Jeanne Guillemin, an anthropologist and senior fellow in the security studies program at MIT, may have known as much about anthrax as anyone in the world even before starting her exhaustive research for this book. In the 1990s she had participated in investigations of an anthrax leak from a Russian military base and in a conference on the potential use of anthrax by Saddam Hussein and others hostile to the United States. After the first anthrax letters were made public on Oct. 4, 2001, Guillemin became a regular on television and radio shows about the crisis. By the end of 2001, anthrax had killed five people, including a photo editor for a Florida-based tabloid, two Washington postal workers, a Manhattan clerk, and a 94-year-old Connecticut widow. Twelve more had been injured by either inhaled or cutaneous exposure to anthrax. The attacks had closed down, for brief periods, both houses of Congress and the main postal centers of Washington and Trenton, N.J., as well as hospitals and several other large facilities. The FBI, the military, the Centers for Disease Control, the newly formed Department of Homeland Security, and hundreds of scientists, law enforcement officers, and bioterrorism experts converged in a massive effort to identify the attacker. Just as suddenly as they began, in November 2001 the attacks stopped. The investigation continued for seven years until, in 2008, the FBI’s chief suspect, a microbiologist at a military research laboratory at Fort Detrick, Md., committed suicide. It appeared that neither Al Qaeda nor Saddam Hussein had sent the deadly bacillus but, rather, most likely, a mentally unstable American scientist named Bruce Ivins. Ironically, Ivins had assisted in the investigation into the attacks and, in 2002, received the military’s highest civilian award for his anthrax research. Though the anthrax crisis lasted only a few weeks, it raised many complex and far-reaching questions: Why were the efforts of federal and state agencies involved in the investigation not better coordinated? What is the proper balance between individual civil liberties and national defense? How extensively should we prepare for biological warfare? Unfortunately, Guillemin’s meticulous recapitulation of every incident and person involved in the attacks and investigation - the “Cast of Characters’’ with which “American Anthrax’’ opens runs eight pages - doesn’t leave much room for these more expansive issues. At times the book has a breathless quality. The author races through the story trying to mention as many people and events as possible, as if tagging so many bases. This is a shame because her narrative skill is evident early on: The book begins with a fascinating and leisurely portrait of Ivins and a similarly patient - and harrowing - account of the first victim’s illness and death. “American Anthrax’’ is a phenomenal, perhaps definitive, reporting of the anthrax attacks of 2001. But a decade later, we want more than reporting - we want some reflection on the meaning of those dark and incomprehensible days. Suzanne Koven is a primary care internist at Massachusetts General Hospital and writes the monthly “In Practice’’ column for the Globe. She can be reached at inpracticemd@gmail.com.